If you've ever heard of the "circle of 4ths" or the "circle of 5ths," they are the same thing as the "circle of keys." It just depends on whether you're moving clockwise or counter-clockwise around the circle. So "C" is at the top of your circle, and Gb (same as F#) is at the bottom of your circle. Now memorize that circle. You'll soon notice that each letter is a 4th above the previous letter -- hence, the "circle of 4ths." Or, if you go the other way, you'll soon notice that each letter is a 5th above the previous letter -- hence, the "circle of 5ths." 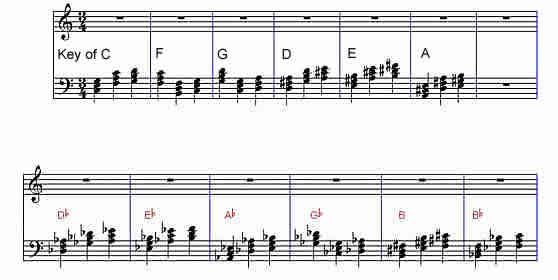 This is the way chords "want" to move -- up a 4th. Or up a 5th. You will find those to be the most common chord progression of all -- up a 4th from the previous chord, or up a 5th from the previous chord. What are the 3 most likely chords in the key of Db? Db (of course), plus the chords on either side of it -- Ab and Gb. Do you see what an enormous advantage this gives you? You have a highly educated guess what chords are going to occur in the song you are playing based on the key that the song is written in. Not only that, you now know that chords like to either move up a 4th or a 5th (or down a 4th or 5th -- same thing). And so as we begin learning chord progressions, this is the first step -- memorize the circle above until you can say it forward and backward and upside down and in your sleep! If I were you, I would print it out and stick it up on your piano or bathroom mirror or wherever you would see it often -- it's that important. Next time we'll take a look at the Circle of Minor Keys -- giving you the same insight in any minor key.